Mary’s Nutritionals has a growing reputation for creating proactive wellness products, helping busy people incorporate relief and relaxation into their day-to-day lives. The innovative range of easy-to-use CBD patches, gels, and lotions brings science and nature together. Browse below to discover for yourself. Based in Denver, Colorado, Mary’s Nutritionals is at the forefront of the burgeoning CBD industry. Designed for busy people, their product range helps those looking to add relief and relaxation into a hectic lifestyle via simple and discreet CBD topicals. Mary’s products are a welcome combination of cutting-edge science and tried-and-tested traditional methods, bringing together modern and natural elements to produce safe and effective CBD patches, gels, and lotions. Working with a team of chemists, physicians, nutritionists, and botanists, Mary’s Nutritionals has produced some of the most innovative hemp-enriched items available today—none more so than their pioneering Transdermal Patch with CBD. Everything Mary’s creates is carefully sourced from US growers and third-party lab-tested for quality, consistency, and accuracy. Why Choose Mary's Nutritionals CBD Products? Mary’s Nutritionals stands apart as one of the most trustworthy and committed CBD brands around today. The Mary’s product range is defined by its high quality and effectiveness, and the team behind it are incredibly passionate about the potential of cannabidiol. Customers are listened to, and their testimonials play a large part in driving new product development. Mary’s mission is to change people’s lives, and one glance at the products on this page should convince you that they’re making great strides in doing just that. 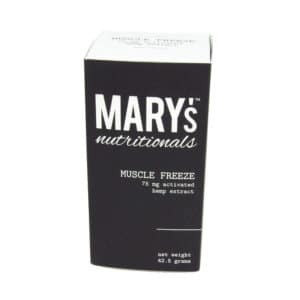 In addition to the unique and game-changing transdermal patch, the Mary’s Nutritionals Muscle Freeze CBD Lotion is a clever alternative to more traditional CBD topicals. Ideal for post-workout relaxation, this cooling CBD lotion is chock-full of natural and nourishing ingredients, good for your muscles and your skin. Or if you’d prefer even more localized relief, the Mary’s Nutritionals Cannabis Ointment Gel Pen is the perfect on-the-go CBD companion. Delivering quick and soothing CBD in a discreet dispenser, the pen contains fifty two-milligram servings of gel (100 milligrams of CBD in total). Why Order Mary's Nutritionals Online? 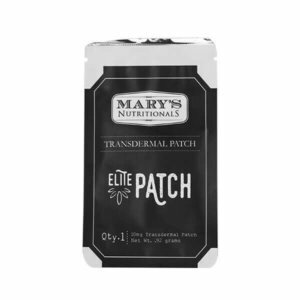 CBD patches and lotions offer a terrific alternative to other pain-relief products, but why should you purchase your next Mary’s Nutritionals product online? Well, with Healthy Hemp Oil, you can browse and buy from anywhere, and at any time. We’ve made buying quality CBD oil products online easy, and thanks to our carefully curated and simple-to-use web shop, you’re bound to find just what you’re looking for. Remember: If you’re pregnant, lactating, or suffering from a serious illness, ask your physician before taking any supplements, applying topical oils or patches, or changing your diet in any significant way. Also, remember to keep your Mary's Nutritionals CBD products in a dry and cool place, out of the reach of children and pets. We have a clear mission here at Healthy Hemp Oil: become the most consumer-focused provider of CBD topicals, patches, and lotions available anywhere online. To achieve this, we’ve committed our time to researching and sharing the very latest objective information about CBD and its potential benefits. Our attention to detail also extends to our selection of CBD topical products, such as the Mary’s Nutritionals CBD Gel Pen. It’s important that you feel satisfied with your next CBD purchase, and if you’re ever worried about anything related to CBD, our clued-up support team are only ever a click away. Check out the Mary's Nutritionals CBD products for sale, or get in touch if you have any questions.